This Giemsa stained micrograph depicts an example of a slightly acidic slide that yielded a pink colored resultant stain. 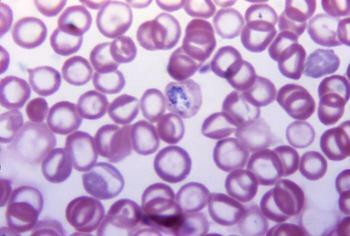 The micrograph shows malarial cells. Photo courtesy of the Public Health Image Library. Cell staining is a technique that can be used to better visualize cells and cell components under a microscope. By using different stains, one can preferentially stain certain cell components, such as a nucleus or a cell wall, or the entire cell. Most stains can be used on fixed, or non-living cells, while only some can be used on living cells; some stains can be used on either living or non-living cells. The most basic reason that cells are stained is to enhance visualization of the cell or certain cellular components under a microscope. Cells may also be stained to highlight metabolic processes or to differentiate between live and dead cells in a sample. Cells may also be enumerated by staining cells to determine biomass in an environment of interest. How Are Cells Stained and Slides Prepared? Permeabilization - treatment of cells, generally with a mild surfactant, which dissolves cell membranes in order to allow larger dye molecules to enter inside the cell. Fixation - serves to "fix" or preserve cell or tissue morphology through the preparation process. This process may involve several steps, but most fixation procedures involve adding a chemical fixative that creates chemical bonds between proteins to increase their rigidity. Common fixatives include formaldehyde, ethanol, methanol, and/or picric acid. Mounting - involves attaching samples to a glass microscope slide for observation and analysis. Cells may either be grown directly to the slide or loose cells can be applied to a slide using a sterile technique. Thin sections (slices) of material such as tissue may also be applied to a microscope slide for observation. Staining - application of stain to a sample to color cells, tissues, components, or metabolic processes. This process may involve immersing the sample (before or after fixation or mounting) in a dye solution and then rinsing and observing the sample under a microscope. Some dyes require the use of a mordant, which is a chemical compound that reacts with the stain to form an insoluble, colored precipitate. The mordanted stain will remain on/in the sample when excess dye solution is washed away. What Are Some Common Stains? There are several types of staining media, each can be used for a different purpose. Commonly used stains and how they work are listed below. All these stains may be used on fixed, or non-living, cells and those that can be used on living cells are noted. Eosin - a counterstain to haematoxylin, this stain colors red blood cells, cytoplasmic material, cell membranes, and extracellular structures pink or red. Ethidium bromide - this stain colors unhealthy cells in the final stages of apoptosis, or deliberate cell death, fluorescent red-orange. Fuchsin - this stain is used to stain collagen, smooth muscle, or mitochondria. Hematoxylin - a nuclear stain that, with a mordant, stains nuclei blue-violet or brown. Hoechst stains - two types of fluorescent stains, 33258 and 33342, these are used to stain DNA in living cells. Iodine - used as a starch indicator. When in solution, starch and iodine turn a dark blue color. Malachite green - a blue-green counterstain to safranin in Gimenez staining for bacteria. This stain can also be used to stain spores. 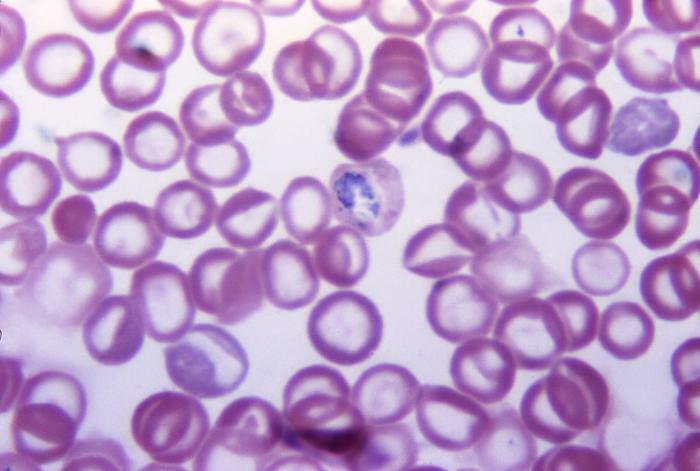 Methylene blue - stains animal cells to make nuclei more visible. Neutral/Toluylene red - stains nuclei red and may be used on living cells. Nile blue - stains nuclei blue and may be used on living cells. Nile red/Nile blue oxazone - this stain is made by boiling Nile blue with sulfuric acid, which creates a mix of Nile red and Nile blue. The red accumulates in intracellular lipid globules, staining them red. This stain may be used on living cells. Osmium tetroxide - used in optical microscopy to stain lipids black. Rhodamine - a protein-specific fluorescent stain used in fluorescence microscopy. Safranin - a nuclear stain used as a counterstain or to color collagen yellow. After staining cells and preparing slides, they may be stored in the dark and possibly refrigerated to preserve the stained slide, and then observed with a microscope. This teaching activity uses a step-wise process to aid the student in familiarity with the use of the microscope as well as to increase the success rate with which they are able to stain and view microorganisms. Gram Stain Process Animation - this page from North Carolina University contains a link to an animation depicting how Gram staining (a technique that distinguishes between two groups of bacteria) works. Case Studies in Microscopy - this resource was accessed through BioSciEd Net (BEN) digital resources collection, which is the National Science Digital Library (NSDL) Pathway for biological sciences education. The resource itself requires a subscription or purchase of the activity from MicrobeLibrary.org. This website has three auto-tutorial case studies (about biofilms, microbes in a watershed, and an outbreak) that ask students to analyze and interpret microscopic images. MicrobeLibrary Atlas CD - The American Society for Microbiology (ASM), a member of the BEN Collaborative who are contributors to the NSDL Biological Sciences Pathway, has just released the MicrobeLibrary Atlas CD. This CD provides 329 images that portray results from the use of standard microbiology protocols and media such as Gram Stain, Blood Agar, MacConkey Agar, Triple Sugar Iron Agar, and more. The MicrobeLibrary Atlas CD is available for $18.00 plus shipping and handling. To order, visit the ASM estore.